At time, I wish I was in back in the quiet town of Sri Aman in Sarawak. I was there two weeks ago for my cousin's wedding. Her husband is from Sri Aman, so they need to have a wedding dinner at his hometown. 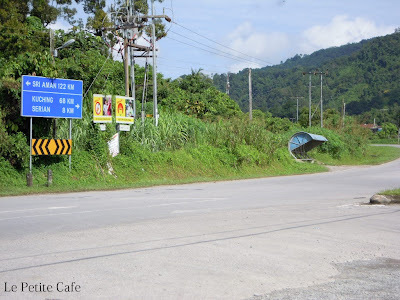 The distance between Kuching and Sri Aman is about 193 km but it took us almost three hours to reach the town from airport, mainly due to travelling on trunk road and an old Toyota Crown as our taxi. It is a peaceful town and one that carry its name well; my cousin-in-law said that there is hardly any crime in the town (Aman meant peace in Malay language). The pace of life here is much, much slower than in KL and even Kuching; the shops actually close around 3pm! There are a lot of swift birds in the town. 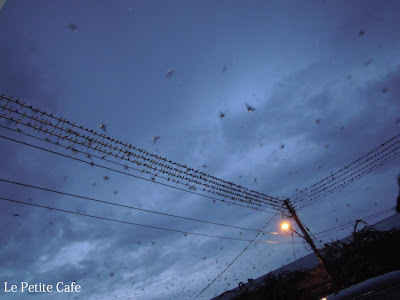 At night, they gathered at the electrical wires like above and sleep! Swift birds are famous for producing the bird's nest soup but according to cousin-in-law, those found in the town are not the type that produces this delicacy.